For the first 2 years of a baby's life pediatricians agree that it is best for the development of baby's feet if they are barefoot. For obvious reasons this is not practical. The next best thing is a soft flexible shoe that will allow your baby's feet to move and grow naturally. Please note that our baby shoes are sized on the large size so please measure your baby's feet before purchasing. Please note that all our leather is chemical free. Our shoes are on the large side, To Ensure the sizing is correct we politely ask you to measure your baby's feet before purchasing. However, if the shoes do not fit you may if course return them for a FULL REFUND, no questions asked. 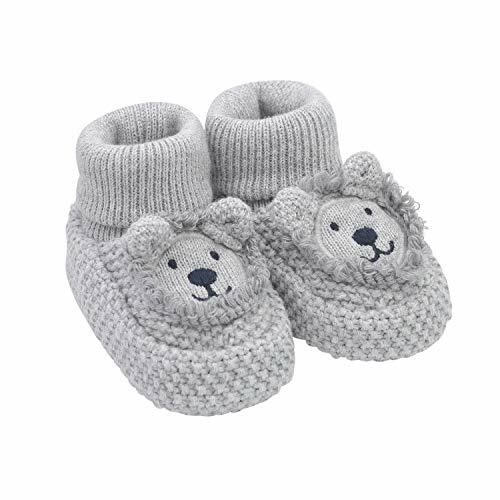 BEAUTIFUL SOFT LEATHER CRIB SHOES - The baby shoes by Juicy Bumbles are made of beautiful flexible soft leather and have a protective non slip suede sole which will allow your babies feet to naturally move and grow. RECOMMENDED BY PAEDIATRICIANS - Our soft leather infant shoes are highly recommended by Paediatricians as they offer great protection and support for little feet without hindering the growth or movement of the foot. They promote good balance whilst offering great protection. Paediatricians recommend that babies should wear baby shoes that are on the large size, this will ensure that the shoes do not restrict growth. BEAUTIFUL DESIGNS YOU AND YOUR BABY WILL LOVE - We have many beautiful designs of baby girl shoes and baby boy shoes to choose from. Our shoes are available in the following sizes, newborn shoes 0-6 months, 6-12 months, 12-18 months, 18-24 months. Please use our sizing chart to measure your baby's feet before purchasing. 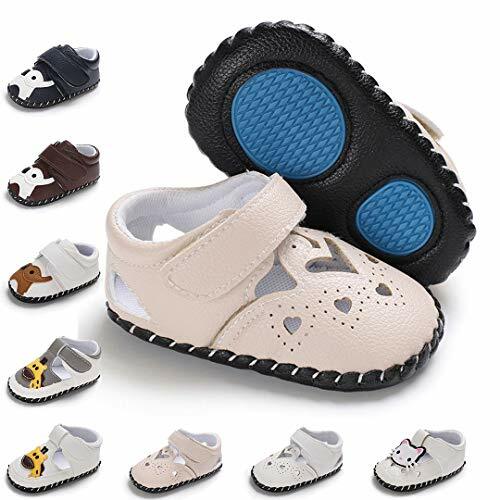 Our baby walking shoes should be worn on the large size, this will ensure that the shoes will allow complete freedom of movement and will not restrict growth. WHICH SIZE TO ORDER - Our baby moccasins should be worn on the large size to ensure that your baby's foot is not restricted in any way. To Ensure the sizing is correct we politely ask you to measure your baby's feet before purchasing. However, if the baby shoes do not fit you may of course return them for a FULL REFUND, no questions asked. A favorite of mom s and kids for 30 years, these Sesame Street cookie Monster puppet slippers will be your child's favorite, too. 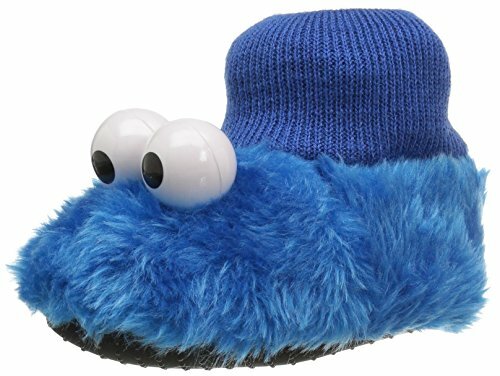 Your child will love having cookie Monster to play with: on your foot it s a slipper. On your hand it s a puppet! this classic slipper style is easy to slip on, with a knit sock top around the ankle to keep little feet to as tie warm. Perfect for wearing around the house, these cookie Monster slippers have a stippled bottom for added traction. Deep foam cushions little feet, and the faux-fur material keeps feet warm. Buy the elmo slipper version as well, and put on a puppet show. Med (size 11/12) would be for a typical 5 to 6-year-old; large (size 13/1) would fit a typical 6 to 7-year-old; and x-large (size 2/3) would be appropriate for 7 to 8-year-old. It's a slipper - it's a puppet: on your foot - it's a slipper. On your hand - it's a puppet. Stretchy knit collar: keeps little feet warm and toasty. Officially licensed: officially licensed slippers from Sesame Street. Foam footbed for cushion: foam footbed cushions every step. FANTURE is a brand specializing in footwear with excellent sales volume of some fashion shoes. 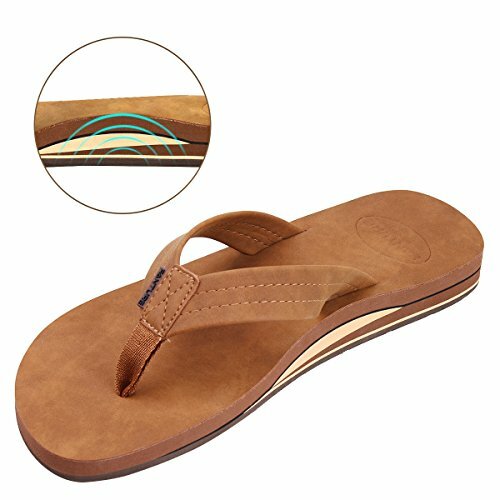 Arch Support You will find strong arch support and arch protection to de-stress your feet. Toddler boys slippers are made with solid rubber sole and warm plush linen. Nice designer upper. The lovely cartoon slippers are very Soft & Anti-slip, inner sole structure specially designed to protect the natural infant foot. 1. Please pay attention to the size before purchase. Cozy warm plush lining and cute Dinosaur design. The light-weight and durable rubber sole makes the slippers perfect for indoor and outdoor use. Perfect great gift.You can choose it as your or your friend's son, the daughter's birthday or Christmas gift. Please kindly check the size before purchase, if you do not know how to choose, please contact us for help. BENHERO Great little first walker shoes,perfect for learning walk. - Note: It is manual measurement, there may be 1-2cm tolerance. Thanks for your understanding. - Note: The recommended age is just for your reference,Please measure your baby's foot length to choose the right size for your baby. - We are appreciate you can share your experience with the customers. Thanks in advance. 1 -[ Cozy Fleece ] Soft, lightweight and anti-slip sole is well-crafted to make walking feel natural. 2 -[ HOOK AND LOOP ] Hook and loop self adhesive to prevent prewalker baby from kicking booties off. 3 -[ Non-Slip ] Dots Non-Skid Rubber Grips on Bottom to prevent slips and falls. 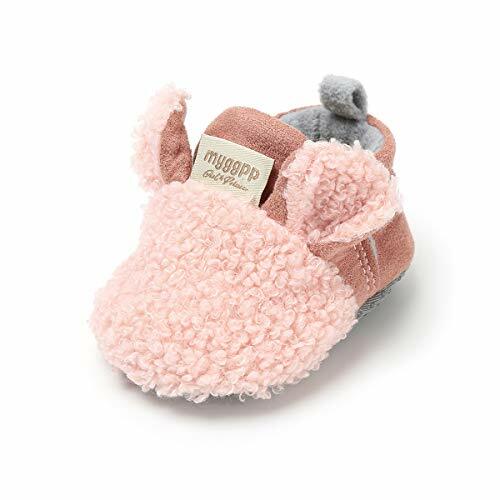 4 -[ Great Gift ] Perfect For Walking, Playing, Crawling, Going Out, And Sleep Etc.These Booties would be a Best Baby Newborn, Shower, First Birthday Gift. 5 -[ Guaranteed ] 100% Guaranteed to return the shoes by free without any reason. We are a professional footwear manufacturer more than 5 years. First , We choose good quanlity material for all of our products. 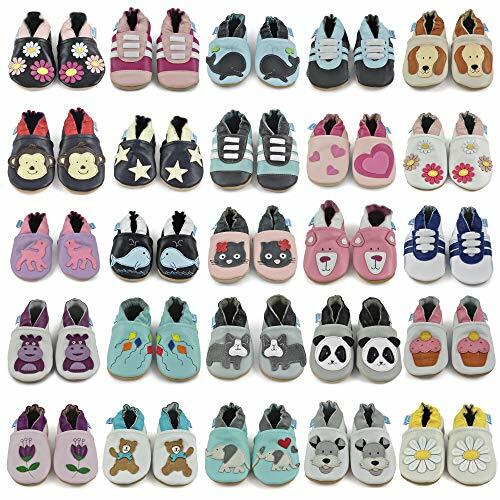 second, Our design are adorable, elastic support, flexible, soft nonskid sole & substantial upper baby shoes, They are wonderful shower gift crafted with the utmost care & love for your little sweet heart . We provide general age recommendations for each of our sizes but every child is unique! Please measure your baby's feet length to chooes the correct size, thanks! Please allow 0.5-1 cm difference due to manual measurement. We Will offer best customer service as always do . So if there is anything we can help , Please no hesitate to contact us, thanks! TWO ADJUSTABLE SNAPS FIT! -- SUPPER SOFT fleece material; When you're tying to layer up, snap closed is really adorable; Elastic ankle support, non-skid sole for safe & to keep it easy to put on, soft bottom for comfy fit, still keep feet covered & warm all day and night. Easy Wear & Stay On -This Baby Socks are Easy On, Easy Off, A Hook and Loop Closure makes Our Infant Booties Easy to Put On, Take Off and Adjustable,And Most Importantly Stable On Your Baby's Feet Won't be Kicked Off! Safe & High Quality -Our Baby Slippers Approved Safety Test.Skin Friendly.Without any Stimulation to The Skin of Baby. Durable Enough to Maintain It's Shape and Feel after Extended Wash and Wear. 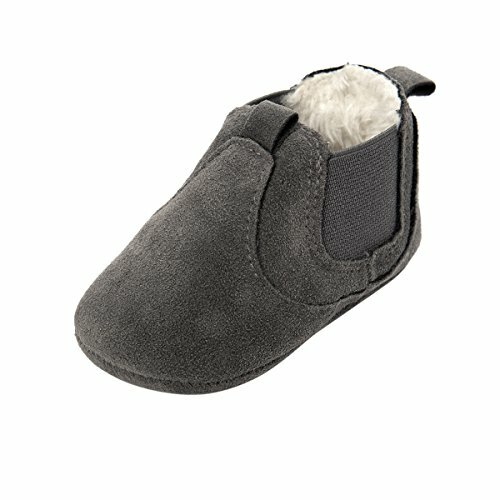 Cute & Great Gif - Actually These Fleece Booties looks quite smart- ideal for Walking,Playing,Crawling,Going Out,And Sleep Etc. would be a Best Baby Newborn,Shower,First Birthday Gift. 100% GUARANTEED FOR LIFE! -- No any stimulation to the skin of baby; If any quality problems with our booties, you're welcome to return it for a replacement pair or fully refund. Every baby is an angel, we are the parents of these angels, we want to give the best of everything to our baby. Sakuracan Company was Established in 2009. Sakuracan is a fashion, vibrant and creative brand. Our aim is to provide the best product for all baby. Sakuracan baby product offers great quality, affordable prices and stylish designs to mom. We are dedicated in providing baby and kids booties,moccasins,sneakers,loafers,sandals,flats mary jane,water shoes more than 9 Years. Our shoes are designed to last and last,using only the top quality. We have a lot of repeat customers and we are honored to serve them again. We provide general age recommendations for each of our sizes but every child is unique! Please measure your baby's foot length to choose the right size for your baby. Please allow 0.5-1 cm differs due to manual measurement. If you have any question,please contact us in the first place, We will do our best to solve them for you. without any reason. Your satisfaction is our 1 priority! MATERIAL - The baby booties are made by super soft fleece&cotton, use environmentally and baby friendly materials, safety baby shoes of tested for peace of mind. 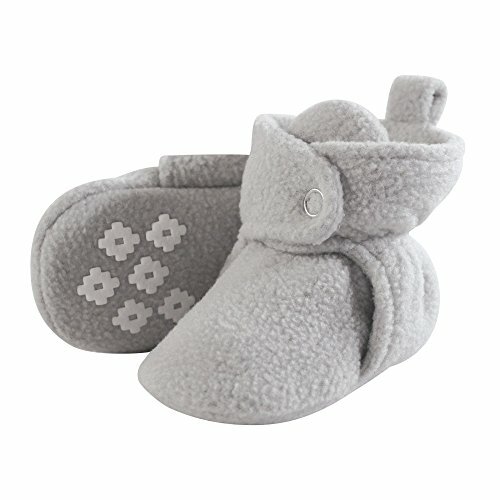 WARM - Our baby slipper made of soft and comfortable fleece and cotton,the newborn fleece booties keep your little baby warm ,comfortable and breathable all the way. ANTI-SKID SOLE - The bottom of crib shoes with or without dots is for anti-skid. And the sole is foldable,lightweight and well-crafted to make walking natural. EASY WEAR - Cotton elastic sock mouth makes our infant booties easy to put on, take off and adjustable.And most importantly stay on your baby's feet won't be kicked off. 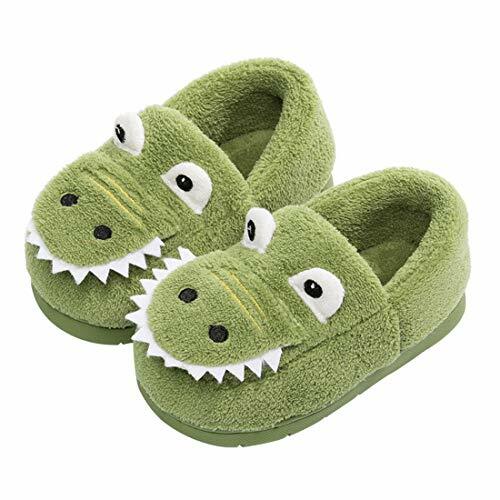 OCCASION - Cute toddler shoes perfect for playing,crawling,sleeping,playdates,family gathering or first birthday and baby shower gifts. 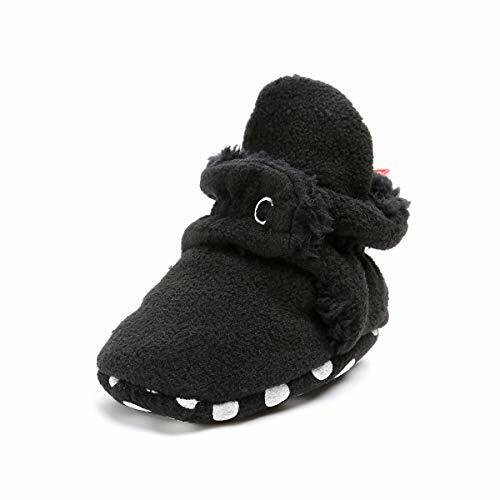 Little Treasure cozy fleece bootie slippers are the best booties to keep your little one's feet warm through the cold months. These booties are made out of soft fleece material that is soft and cozy. With a snap closure with 2 size options, these booties will fit your little one for a while, but more importantly, will stay on your baby's feet! booties have a non skid bottom to help prevent all slips and falls for your little cruisers and walkers. Sizes available up to 24 months. 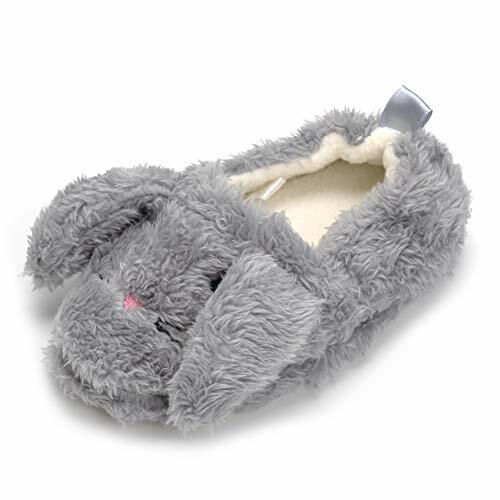 Toddler slippers are made with solid rubber sole and warm plush linen. inner sole structure specially designed to protect the natural infant/Toddler's foot. 1.Due to difference of displayer,there may have slight color differences. 2.Kindly note that there may have 0.5cm/0.2inch size error. 3.The recommended age is just for your reference,Please choose the size by measuring your baby feet before purchasing. 4.Leaving 0.2inch of growing room in shoes is recommended.Toddler slippers are made with solid rubber sole and warm plush linen. 4.Leaving 0.2inch of growing room in shoes is recommended. Tips 100% Satisfaction Guaranteed Zero Hassle Returns - Return your shoes for any reason. - Give Your Baby an Interesting Childhood.\ ^o^ / This Unique Cute Cartoon Animals Shoes is A Must for Moms! - They Will Give You and Your Baby Freedom to Explore the Secrets of Animals. Show a Fun Side of the world. BENHERO Baby Cartoon Shoes are Built to Safety and Fashion for First Time Walkers. Designed to be the Healthiest Baby Shoes for Newborn Boys and Girls Foot. 1. FASHION STYLE Adorable Choice of Baby-Friendly Cartoon Designs will make Your Heart Melt. 2. ROUND TOE DESIGN Round Toe Design will Keep Her Feet Safe when She Cruises. 3. SOFT COTTON LINING We Believe that You & Your Babies will Love Our Cute ANIMAL Cartoon Shoes. 4. HAVE AN ACTUAL SOLE Perfect Outdoor or Indoor, First Walker Shoes for Infants, Baby, Prewalkers and Toddlers. [ SAFE TESTED ] -- Soft PU Leather and Breathable Cotton Lining. No Any Stimulation to the Skin of Baby. [ EASY WEAR ] - Adjustable Hook and Loop Closure Make for a Perfect Fit for Your Little One. They will Stay On Your Baby Feet the Whole Time. [ UNIQUE CARTOON DESIGN ] -- Infant Cartoon Animal Shoes Will Give Your Baby Freedom to Explore the Secrets of Animals. Show Them a Fun Side of the World. [ ANTI-SLIP SOLE ] -- These Baby Cartoon Shoes Have a Flexible Rubber Soles, Let Baby Move Freely. Perfect for both Crawlers and New Walkers. [ PERFECT GIFT ] - The Slip-on baby Cartoon Shoes are Perfect for Party, Wedding, Photography, Family Gathering or even just Lounging around the House. It would bring much Attention and Compliments for your Sweetheart. Perfect Baby Shower, Birthday,Christening Gift. SAFE - Safety Test Approved.No Any Stimulation to the Skin of Baby's Feet. 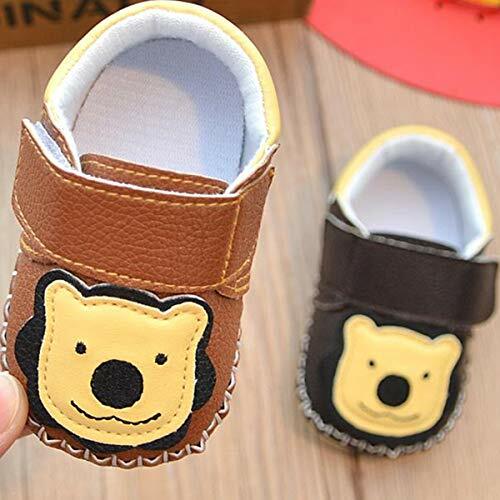 COMFORTABLE - High Quality PU Leather baby moccasins,Cushioned Anti-slip Breathable Sole is Good for baby learn to walking. EASY WEAR - Adjustable hook and loop closures Makes our infant slippers Easy to Put on,Take off,and Stay on. FASHION - Crib shoes combined with cute cartoon animals design made baby more lovely. And able to match a lot of different looks. Suit for any occasion. GUARANTEE - LAFEGEN baby shoes store with lifelong service for you.Any unsatisfied with product, please contact us (through Amazon if past the standard return window) and we will be happy to provide you with your choice of a replacement or refund. Your little racer will adore the cute details and plush bliss when he slips into these toddlers' slippers inspired by the Disney Pixar franchise Cars. 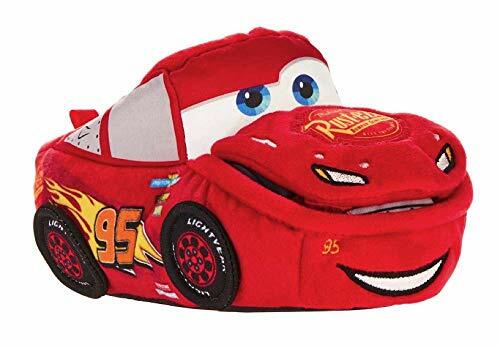 Featuring a pillowy-soft and lightweight construction, these slippers are inspired by the legendary Lightning McQueen, complete with embroidered tires on the sides and a Velcro hood flap that can be raised to reveal a powerful engine underneath. The skid-resistant sole helps him maintain his footing on smooth surfaces, while the heel loop allows for easy on and off. These officially licensed Cars slippers are available in red and make a fun and cozy addition to his loungewear collection.